Even if you’re not familiar with the concept of a World Heritage Site, almost all of Spain’s most impressive monuments fall into this category, from the Moorish glories of the Alhambra to Gaudí’s dizzying Sagrada Família. Established by the UN’s Unesco agency in 1972, the World Heritage program recognizes and protects places of outstanding natural or cultural significance, including world-famous places like the Grand Canyon in Arizona but also lesser-known ones like the Chaco Culture ruins in next-door New Mexico. In fact, Spain is home to the third-largest amount of World Heritage Sites in the world, behind only Italy and China, with 44 sites on the list, and the small region of Galicia in the country’s northwest corner lays claim to three of those. Now, in my highly-biased opinion (having lived there for two years) I think there ought to be a few more Galician sites selected, from the monasteries and vineyards that perch along the Ribeira Sacra canyon to Atlantic islands like the Cíes and the Ons, but that’s a story for another post. Galicia’s three World Heritage Sites still capture part of what makes this region so very fascinating. 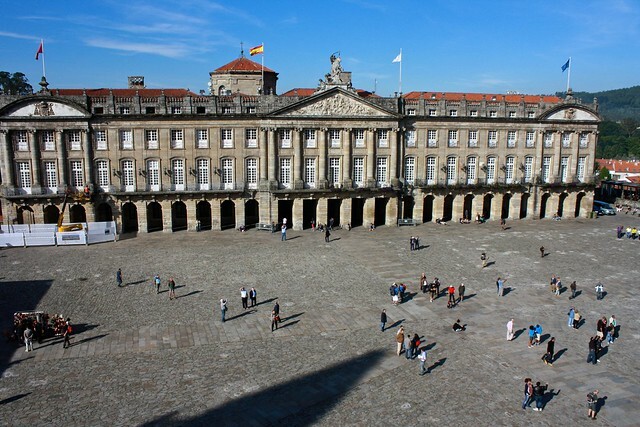 Catholics in the Middle Ages considered Santiago de Compostela to be one of the holiest cities in the Christian world, as its cathedral guarded the supposed relics of the Apostle St. James—a man who belonged to Jesus’ inner circle and whose remains happened to resurface at the same time Christian Spaniards were attempting to “re-conquer” Spain from the Muslims. A pilgrimage route here quickly grew in popularity and drew millions of medieval European pilgrims to this lonely outpost in northwestern Iberia: the Camino de Santiago. 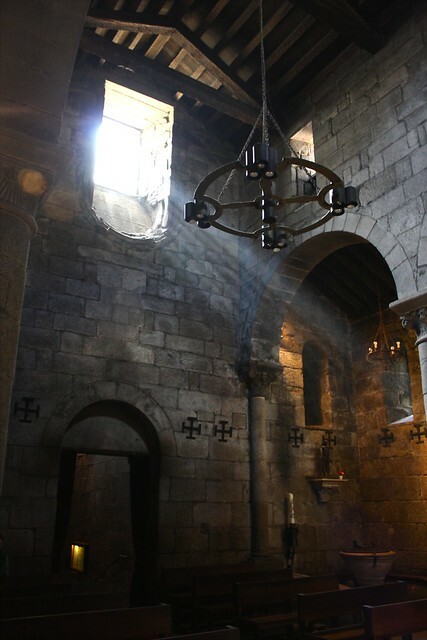 To accommodate the huge crowds, a stunning cathedral was built in the early 1200s in the Romanesque style, replete with austere granite arches and intricate religious sculpture. During the Baroque era, gaudy new façades flowered up all around the church, reinvigorating the faith of pilgrims and locals alike. But Santiago isn’t just the cathedral. Around two dozen parish churches, monasteries, and convents pepper the historic core, offering you a journey back through time in which you can appreciate every major European architectural movement. The old town’s centuries-old houses are all built from local granite, sometimes whitewashed save for the windows, sometimes letting the natural stone show, and often capped with glassed-in balconies called galerías. Two of the major streets in the southern half of the old town—Rúa do Vilar and Rúa Nova—are bounded on either side by soportales or arched, covered walkways that spring out from these homes and provide shelter from the rain. Like the rest of the Iberian Peninsula, the region we know today as Galicia once belonged to the Roman Empire. The inland city of Lugo served as a regional capital in the Roman province of Gallaecia, and, as befitting a major Roman city, was encircled by imposing defensive walls. 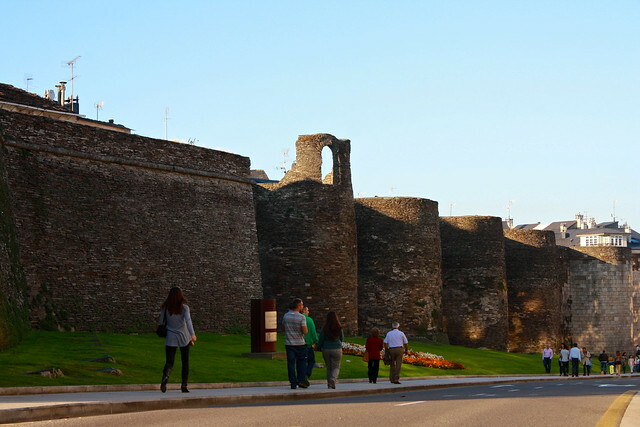 Built in the late 200s CE in local slate stone (that Lugo-ites still use today for roof shingles), these completely-intact walls stretch for more than 2km around Lugo’s historic city center. 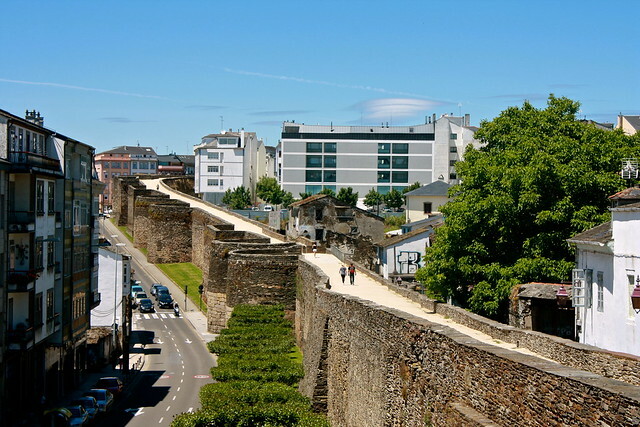 In contrast to other old Spanish cities like Ávila that make you pay a fee to access a portion of their city walls, Lugo lets anyone walk up a ramp and explore the walls, day and night, for free. Along the trail that runs on top of the walls, you’ll commonly run into folks going on paseo (afternoon stroll) or their daily jog. It also makes for a great way to check out the city from above, especially when Lugo breaks out into partying during its Roman reenactment festival, Arde Lucus, every June. 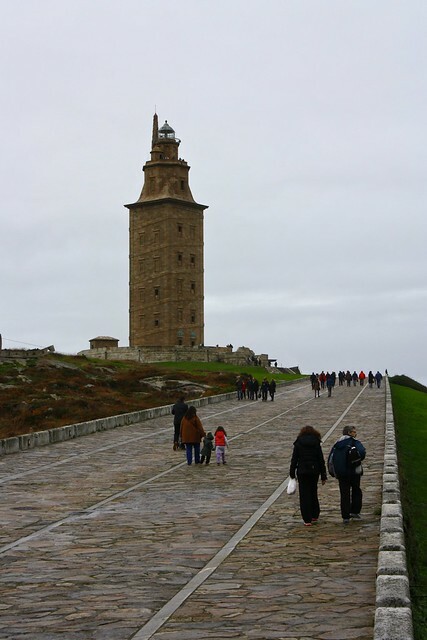 Perched on a strategic peninsula on Galicia’s north Atlantic coast, a Roman lighthouse still stands sentry just outside A Coruña’s urban center. Constructed by the Romans in the 2nd century CE, it holds the honor of being the world’s oldest (and only) Roman lighthouse still in use today. For local residents, it has become a major source of pride and appears on the municipal logo. Between 1788 and 1806, the lighthouse was completely restored and given a shiny new façade in then-popular Neoclassical style—so what we see today from the outside is not what it would have looked like in Roman times. But when you climb up the staircases inside the tower, you still get to marvel at Roman engineering: heavy masonry blocks that have endured nearly two millennia of invasions and earthquakes and interior arches that have buttressed it from collapse. 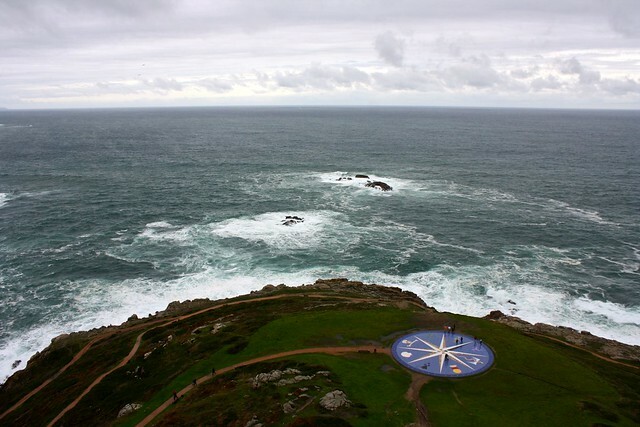 From the very top, just below the modern “lantern,” you can take in views of Coruña, sprawling toward the south, and the Atlantic, reaching to the northern horizon. Which World Heritage Site on this list sounds most interesting to you? And have you been to any of these monuments? Share below in the comments!